Mrs. Kemery comes to Monticello Montessori with eight years of experience in school administration. She loves teaching and learning! Not counting her time as a student, she has three decades of education experience in traditional schooling, homeschooling, online schooling, and school administration. Her special interest is achievement improvement that leads to academic excellence, particularly in rural settings. Mrs. Kemery has taught at every level from preschool through master's level courses. She likes to learn too, which is why she has a couple of bachelor's degrees, a master's degree, and an education specialist degree. Mrs. Kemery is an alma mater of the University of Washington, the University of Idaho, and Northwest Nazarene University. She grew up on the Kitsap peninsula in Washington, was an exchange student to Germany in high school, and has lived in Idaho for more than 30 years. Challis is her family home, where she currently has horses, dogs, cats, chickens, and cattle for pets. Her hobbies include spending time with her family, feeding wild birds, collecting and reading vintage novels, and playing music. Nari was born and raised in Portland, Oregon. She served an LDS mission in the Italy, Padova Mission, which included Venice, Pisa, and Florence. Nari and her sweetheart, Shawn, have been married since 1994. Together they have three children and soon, two grandchildren. Over the years they have had several foreign exchange students in their home, three of which have been from Italy and one from Denmark. Nari attended BYU-Idaho and is currently working towards continuing her education. The Mendenhalls are active in serving the community. Community events that they participate heavily in are the Festival of Trees, Tedx, and LIVE, as well as serving at the Idaho Rescue Mission as needed. The Mendenhall family came to Monticello as the founder, Dave Meyer, was creating a waiting list to start the school. Two of their children have attended the school since its beginning, and another worked here as a teaching assistant. Nari began working in the classroom during Monticello's first year as a teaching assistant and special projects advisor. She began her third year at Monticello as the school's business manager. Nari loves the school. The staff and the families make Monticello an amazing environment. Born in Preston, Idaho, and raised in eastern Washington, she enjoyed growing up with farm animals while active in 4-H and FFA. Married and mother of seven children, Canda enjoys her dogs, horses, cattle, writing, painting, piano, cello, college studies, and outdoor adventures. Mrs. Call has been a Montessori teacher for 14 years. Her experience includes teaching classes of three-to-six-year-old children, six-to-nine-year-old children, and one year of nine-to-12-year-old children. She definitely likes six-to-nine-year-olds the best! Her favorite thing about teaching is helping children discover how much they can do. She says, "Children will really stretch their comfort zone once we have established a relationship of trust." Mrs. Call has Montessori training for three-to-six-year-old and six-to-nine-year-old students. She holds a current teaching certificate in the state of Idaho for kindergarten through eighth grade. She is a graduate of I.S.U. with a degree in early childhood education. She brings an enthusiasm to the classroom that is contagious. She often hears groans from her students when the dismissal bell rings. She once had a group of students that would rather spend time inside doing research on a warm spring day then outside flying kites. Erin is committed to the development of young minds and is grateful for the opportunity to work with your children. After completing a bachelor of arts degree from The Evergreen State College in Olympia, Washington in 2006, Erin went on to earn a master's degree in human nutrition from the University of Bridgeport in Bridgeport, Connecticut. Additionally, Erin has experience as a certified nursing assistant through the Wyoming State Board of Nursing. Erin’s professional teaching career began with three years of experience at the Community School in Victor, Idaho, now partnering with Teton Science School in Jackson, Wyoming. Erin was a beloved member of this project-based education school as an after-school program teacher, math and reading assistant teacher, and substitute teacher (preschool through sixth grade). Also, Erin has over five years of experience as a professional childcare provider in Teton Valley, Idaho. After one year of being a teaching assistant in upper elementary at Monticello Montessori, Erin is excited to teach first through third grades in this Montessori education setting. Erin is currently in the mentoring process of attaining an Idaho state teacher’s certificate and is a classroom-ready certified teacher through the American Board for Certification of Teacher Excellence. With a diverse background, Erin brings to the classroom a love for learning, which is sure to inspire your child for a lifetime of curiosity and achievement. Shauna Garner has been a Montessori guide for many years. She received her American Montessori Society (AMS) credentials from Montessori Training Center of the Rockies (MECR) in Boulder, Colorado. She has taught in schools in Kansas and in Texas. Mrs. Garner has her bachelor's degree in communication from Fort Hays State University and will be completing her master's degree in December from Chaminade University. She has been teaching at Monticello Montessori since 2014. Mrs. Whipple has served in various positions at Monticello since its opening in 2010. She attended Brigham Young University and the University of Utah. She has a B.A. 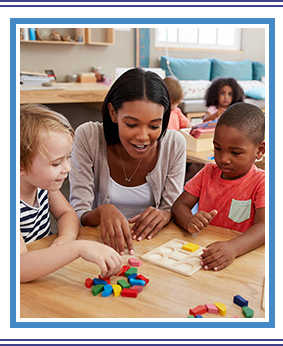 in history, a teaching certificate from the American Board of Teacher Certification, and Montessori certification through the North American Montessori Center. She enjoys spending time with her family and reading. Ralph Armstrong is originally from San Diego, California. He graduated from BYU-Idaho with a B.S. in sociology and is currently enrolled for certification through ABCTE. He plans to pursue his master's degree in education. Mr. Armstrong has worked as a teacher's aide, PSR worker, Title I instructor, and substitute teacher during the past two years at Monticello Montessori. Buddy loves to engage the children in the classroom and also on the playground. He has two young boys ages three and six that he loves to tease and stay active with. Emi Walker was born and raised in Sao Paulo, Brazil. She has a bachelor's degree in communications/public relations from the University of Sao Paulo, Brazil, and also a degree in French as a second language, Civilization and History of France, University de Nancy, France. She was a public relations executive for over 20 years and changed her professional career after becoming a mother. Mrs. Walker worked as a K–6 grade substitute teacher for the elementary schools in district 93 for for over four years. During those years, Mrs. Walker pursued her M.A. in elementary education. Currently she is a certified elementary teacher for the state of Idaho and a certified upper elementary Montessori teacher through the North American Montessori Center. She also teaches our school's GATE program (Gifted and Talented Education). She has worked with Monticello Montessori staff since 2011. Emi has two sons, Luke and Alec. Leslie Woodford fell in love with the Montessori Method when she first toured a Montessori classroom in Savannah, Georgia. More than anything, she wanted her children to have a chance to experience the hands-on, child-driven education. While her children were on the waiting list at Coastal Empire Montessori charter school in Savannah, Georgia, she submitted her own application to work at the school—she’d heard that staff members' children got in automatically. She worked at the school while her youngest son attended the preschool and her older son was in a lower elementary classroom. She enjoyed it so much that she returned to school for formal Montessori training. She holds an American Montessori Society (AMS) Administrator and AMS Elementary I and II credentials from Westminster College. She earned a professional teacher license in 2000 from the state of Colorado and is currently converting that into an Idaho teaching certification through the American Board for Teacher Excellence (ABCTE). She has a master’s degree in curriculum and instruction from the University of Colorado at Colorado Springs and a bachelor of arts in humanities from Brigham Young University. She started at MMPSC in the fall of 2018 and brings 12 years of teaching and training experience to the position. Sign up for her weekly newsletter. Anthony "Tony" Walker was born and raised in Idaho Falls. He has a B.A. in international studies from the University of Idaho and has completed his elementary teaching certification through the American Board for Certification for Teacher Excellence (ABCTE); he also is certified in project-based learning through Buck Institute of Education (BIE), and project-based math instruction through CPM (College Preparatory Math). Mr. Walker speaks fluent Brazilian Portuguese, German, and Spanish. He traveled and worked abroad (Germany and Brazil) and had the opportunity to teach English in Brazil and work with disadvantaged children in an after-school, lower-income organization. As a certified pilot, Mr. Walker taught aviation English to Brazilian pilots as well as private courses for adults. Mr. Walker is very passionate about soccer; he has coached elementary students for over 12 years. He is excited to be back at Monticello Montessori to teach upper elementary. Previously, he worked at Monticello in the special education department and was an instructional assistant before going to another charter school (OCS) where he taught 6th grade math and science, Spanish, German, and arts at the middle school level. During one of his trips to Brazil, Tony met his wife Emi Walker, also a teacher at Monticello. They have two wonderful boys, Luke and Alec. They love to ski, play soccer, and do art projects at home. As an education team, Mr. and Mrs. Walker inspire each other with new ideas and continuous support for better instruction. Mrs. Emma Lindow loves working with kids and helping them improve their knowledge and skills. She has taught elementary music for the last seven years to students in Utah and then in Las Vegas. She is excited to also teach kindergarten this year! She plays the piano, flute, and organ. She also loves to run and has run three marathons. She is excited to teach the kids at Monticello Montessori. Laura Macbeth graduated from Pocatello High School and went on to Ricks College (now BYUI). After raising a family, she returned to school, graduating with a bachelor of arts in German and international studies with a Spanish minor. She then went on to receive a master's degree in public health from the University of Pittsburgh. Laura has worked on many large research projects in Pittsburgh. She had the opportunity to work with the African-American, Amish, and elderly populations. She also worked with a medical residency program on a nutrition project starting with doctor visits, continuing in the home, and then in the community at schools and grocery stores in the area. Laura also taught anatomy and physiology at the Allegheny Community College before relocating to Idaho Falls. She and her husband raised six children—three of whom were terminally ill, one whom they adopted from Korea, and a Native-American foster child. Because of these experiences in her life, she has a compassion and understanding for children and loves working with them. She is currently working on the ABCTE certification so she can continue teaching, which is her passion. “Miss Emily” teaches our preschool. She has been with Monticello Montessori for five years in our kindergarten and preschool programs. She has been the teaching assistant for the past four years and is excited to be teaching this year. She loves yoga, singing, and hiking. She enjoys the smaller children very much and finds that they teach her just as much as she teaches them! Mr. Garner was born here in Idaho. He holds a B.S. in elementary education from Brigham Young University as well as an M.A. in international relations from the University of Oklahoma. Mr. Garner also served 10 years in the United States Air Force. In that capacity, he has deployed numerous times to various parts of the world, but also taught for four years at the University of Kansas as an assistant professor of aerospace studies. During his service to our country, he earned two Air Medals and the USAF Commendation Medal. He separated from the Air Force in 1992 at the rank of captain. Previous to his Air Force service, he taught fifth grade in Homedale, ID, for one year and seventh and eighth grade science for a year at the Bureau of Indian Affairs at the Tuba City, Arizona, boarding school. Mr. Garner holds an Idaho Teaching Certificate. He has experience with the Russian and Navajo languages. He also has a background in financial services. Mr. Garner is passionate about children and wants to see all children succeed. Mr. Garner loves math, science, history, reading, and a good pun, so if you know one, he'd love for you to share it with him! He and Mrs. Garner raised six children, one of whom has disabilities. His life experience makes him a natural fit as our special education teacher. Trudy Matson was born in Idaho and raised in the small town of Kamiah. She graduated from Kamiah High School and attended Lewis Clark State College. While attending LCSC she met and married Phil Matson. Phil and Trudy moved to the Washington coast, and most recently, Monroe, where they raised their two children, Keith and Carissa. Changes in the job market brought Phil and Trudy to Idaho Falls in 2016. Trudy graduated with her B.A. in business management from Northwest University in April, 2017, and looks forward to completing her teaching certificate through ABCTE in the summer of 2018. Trudy has maintained her love of the outdoors that she experienced in northern Idaho, which includes camping and horseback riding. Trudy joined the Monticello Montessori staff as a Title One assistant in the fall of 2016 and then became the assistant coordinator for Title One in the fall of 2017. Ms. Stradley-Bass is a native of Idaho raised in Kamiah. She married her childhood sweetheart in 1988 and had four wonderful children before her husband passed away suddenly in 2003 from a work accident. In 2005, she moved the family to Idaho Falls to take a staff position with her church. In 2009, she remarried. She and her husband have a son, Benjamin. Ms. Stradley-Bass has a bachelor's degree in human services/counseling from SAGU in Waxahachi, Texas. Her local work experience includes case manager and CBRS provider for persons with special needs. In 2015, she entered the Licensed Professional Counseling Program at Liberty University, which has brought her exciting opportunities for studies abroad as well as onsite and online.